I stitched out a few edge to edge designs on Ruthie. 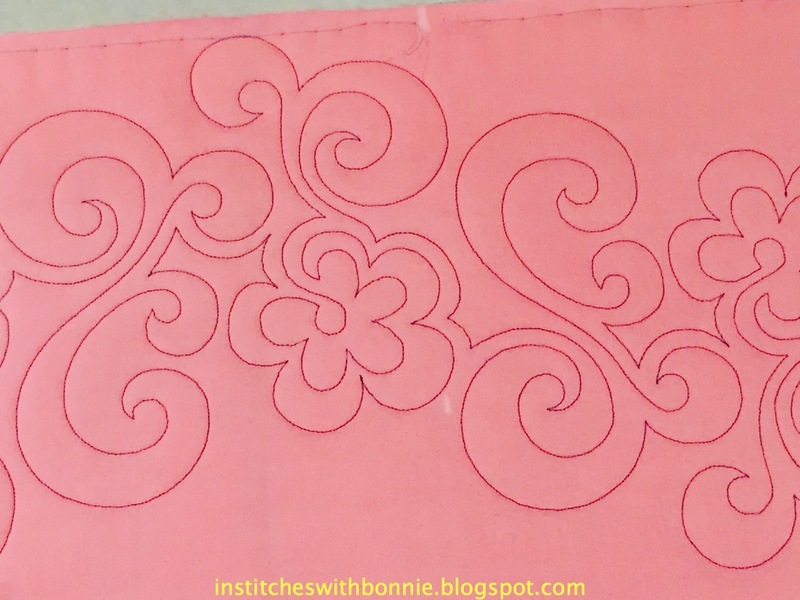 I figure it is nice to be able to show someone what a design actually looks like on fabric. This is called Chamomile, designed by Denise Schillinger. I bought it at DigitechPatterns.com. My order came in from Connecting Threads. Oooh boy! What was I thinking? 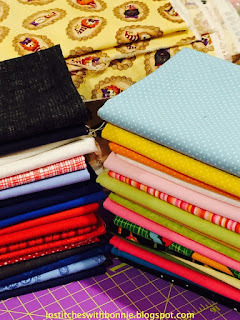 I sure bought a lot of fabrics. One thing I was thinking was these prices were too good to pass up. I ended up with over 12 yards of fabric. Mostly in fat quarters so I got a good variety. I spent some time drawing a little 9 patch quilt in EQ. I don't use EQ as much as I should but I was super tickled I was able to draw what I really want to make with those cute little 9 patches I showed you in my last post. When I get the ok from my customer I'll get going on this little one. I thought I hadn't done well on my goals this week but when I looked at them, I realized I actually had done ok. I'm making forward progress. Cross Stitch – FINISH it NOW! √ all stitched now to make them up! Add border to Zig Zag quilt nope! Here's a picture of Sophie reading a book given to Ellie for her birthday. Sophie loves books! She's sitting in a little recliner we gave Ellie for Christmas last year. It gets used a lot! That's it for me today. 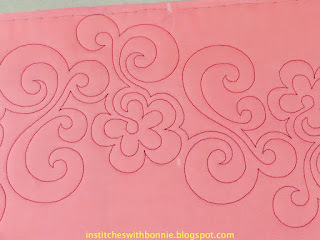 I'm linking up with Love Laugh Quilt, Freemotion by the River and Blossom Heart Quilts. Take a look at what's going on in studios across the internet. okay busy girl, still getting it done aren't you! The nine-patch design is wonderful and looks like it would be fun to make. I love to see children reading books at a young age! 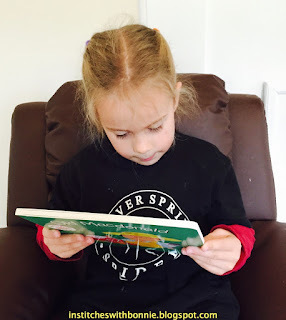 Good to see a little one reading already ... nurturing a life-long love of books and of reading. I love how you're going to use those nine patches. 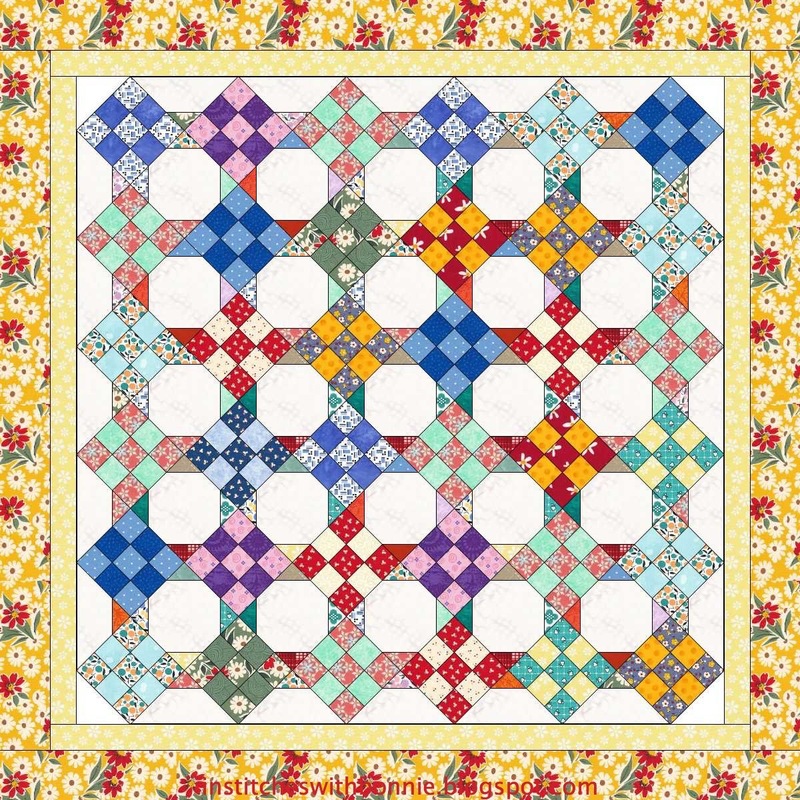 Beautiful quilting pattern. I really like that plan for the 9 patches. Hope you get caught up this week. 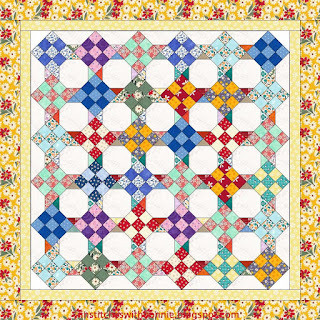 Beautiful quilt design and wow....look at the neat fabrics!! Have fun with them!